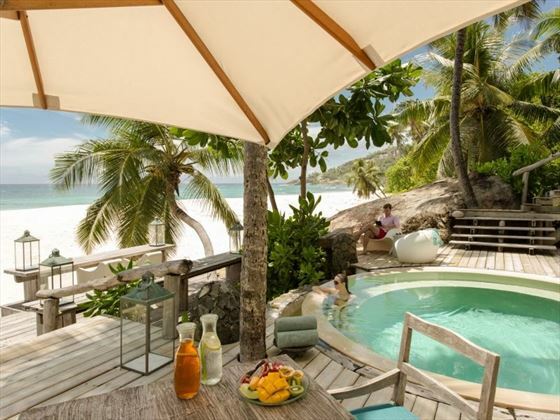 Discover the serene, barefoot island lifestyle at North Island, a beautiful beachfront resort nestled on the Seychelles archipelago of the same name. 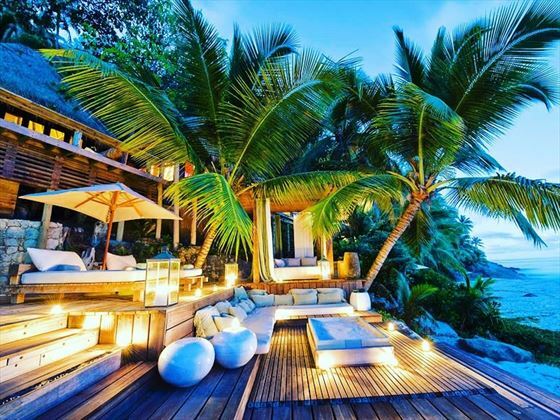 Surrounded by luminous white beaches, swaying palm trees and luscious forests, this resort offers a tranquil ambience and gorgeous Seychelles landscapes. 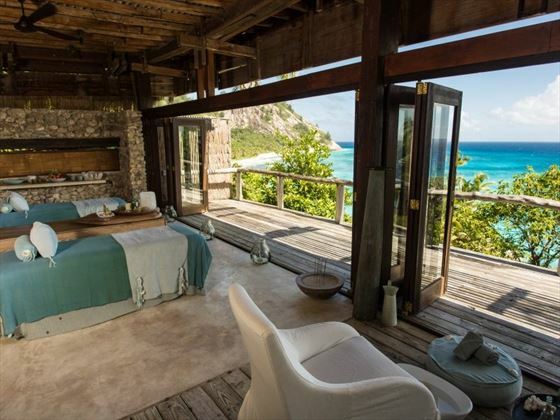 The 11 sophisticated villas are tucked away in the trees, just steps away from the ocean, and are handcrafted by Seychellois and African craftsmen with local wood, stone and glass, offering true natural beauty along the West Beach. 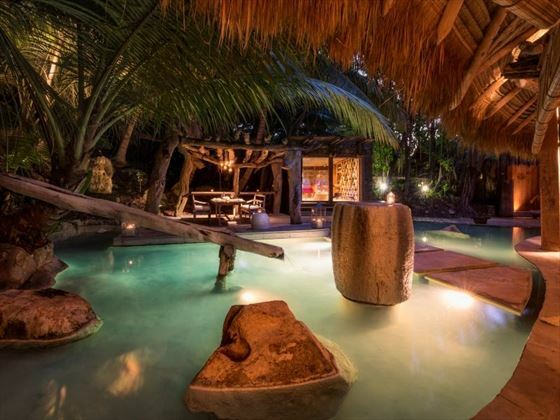 Perfect for nature lovers, couples, and families, this is an island experience you won’t forget. Sit at the North Island Sunset Bar to watch the beautiful sun set, or treat yourself to a soothing treatment at the North Island Spa, offering rejuvenation for your mind, body and soul. At certain times of the year you may even spot a Green Turtle on the shore, or swim alongside them with the resort’s unlimited scuba diving and deep sea fishing excursions. 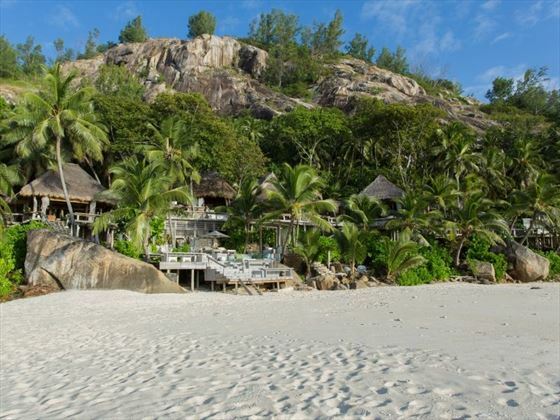 North Island is a beautiful island in the archipelago of the Seychelles, just 30km from the main island of Mahé. 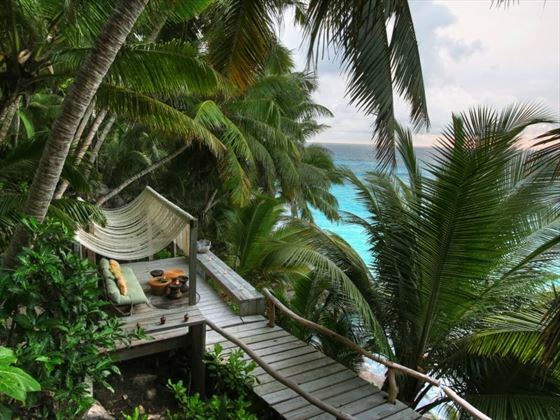 With pristine white sand beaches, soaring granite outcrops and the glistening Indian Ocean surrounding it, North Island is a truly stunning location with a tranquil ambience. 2km long and 1km wide, the island is fringed with four beaches – one for each season – and the gorgeous villas are nestled on the East Beach. 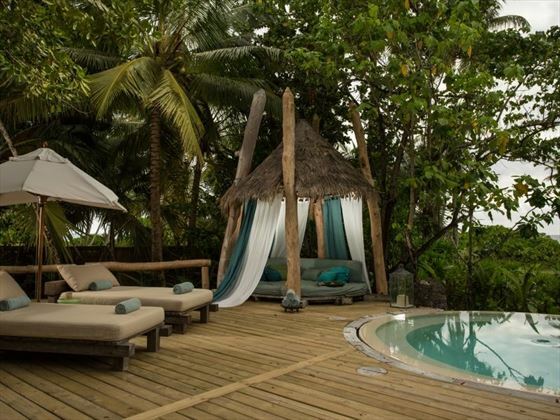 The resort can be accessed via a 20 minute helicopter flight northwest of Mahé. 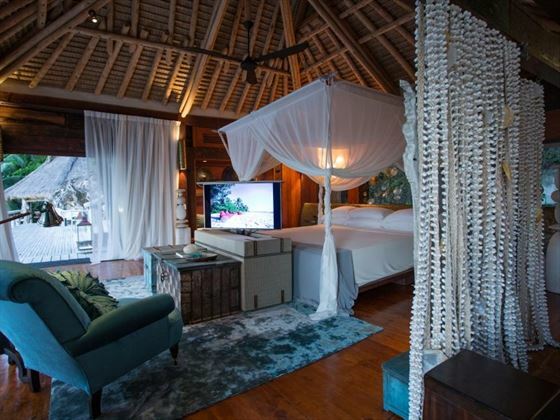 There are a total of 11 villas, all featuring two bedrooms – there is one master bedroom with an en-suite bathroom, whilst the second is a bedroom-come-lounge, study and entertainment room. 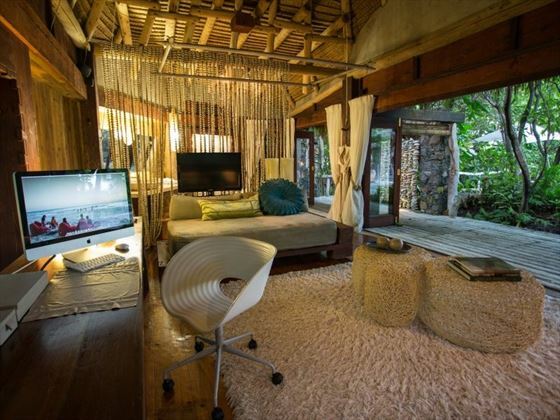 Villas 1 to 10 are 450sqm and nestled in the trees that line Anse d’est Beach, whilst Villa North Island is 750sqm elevated above the beach, and tucked away in the takamaka forests. 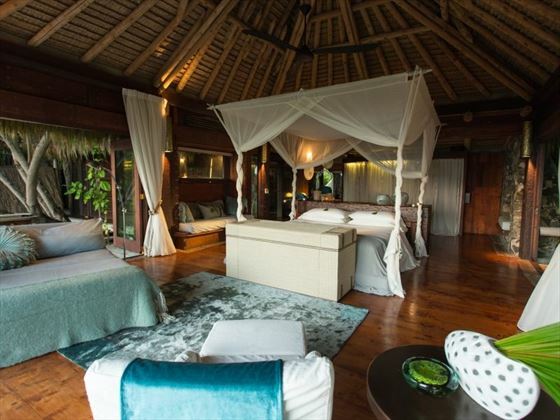 Villas 1-10 sleep a maximum of two adults and two children, whilst Villa North Island sleeps two adults. All of the dishes presented at North Island use produce from the kitchen’s vegetable and herb gardens, with meals influenced by French, Indian and African cuisine. Enjoy distinct Creole flavours and fresh seafood, with the daily menus designed according to the latest island harvest. The Piazza – For a romantic meal for two, head to The Piazza for its candlelit dining and peaceful ambience. A favourite dish amongst the chefs is squid ink linguini with lobster, freshly caught red snapper, langoustines and local octopus. 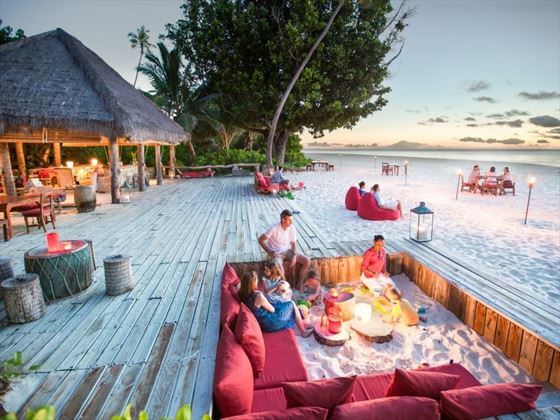 West Beach Bar – Serving fresh, hot pizza and tapas-style BBQ snacks, this bar is fantastic for sharing dishes and relaxing with a beautiful sunset. In-Villa Dining – Make a choice from the stocked pantry or the home-style menu, delivered to your door . North Island Sunset Bar – Nestled at the end of West Beach, this simple, rustic bar offers North Island-style cocktails and snacks. 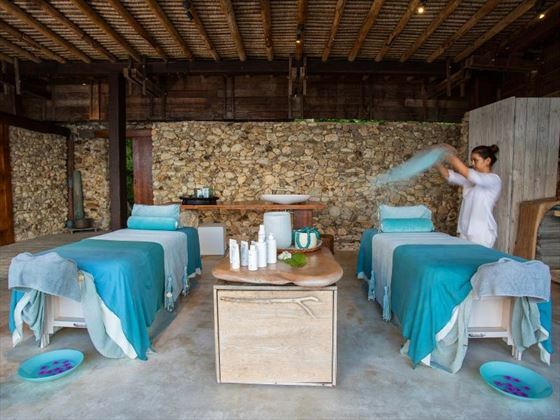 The North Island Spa – Overlooking the glistening ocean and dramatic cliffs, this beautiful spa offers specially designed treatments created with local products. Each treatment is tailor made to suit your specific needs, and you could even enjoy your treatment in the privacy of your villa, on request. All children under the age of 17 stay free, whilst children between the ages of 17 and 19 can stay at a discounted price.